These Energized Semiprecious Fluorite is a highly protective and stabilizing stone, useful for grounding and harmonizing spiritual energy. When working with the upper Chakras, Fluorite increases intuitive abilities, links the human mind to universal consciousness, and develops connection to Spirit. Fluorite further anchors intuitive insights into the physical plane, allowing mental and physical coordination. A popular stone among energy healers, Fluorite can also clear the aura of mucky energies. Fluorite heightens mental abilities, assisting in rapid organization and processing of information and can bring mental clarity and stability to an otherwise chaotic situation. Fluorite absorbs negative energies from the environment and is effective at Aura and Chakra cleansing. Physically, Fluorite is known to strengthen bones and teeth, and ameliorate the pain associated with arthritis. Fluorite is also used to enhance mental functions by balancing the chemistry in the brain. It enhances short term and long term distant memories making it even good for students, scholars and entrepreneurs. Turkish evil eyes (Talisman) are an object which you believe has magic powers to project you or bring you lucks. 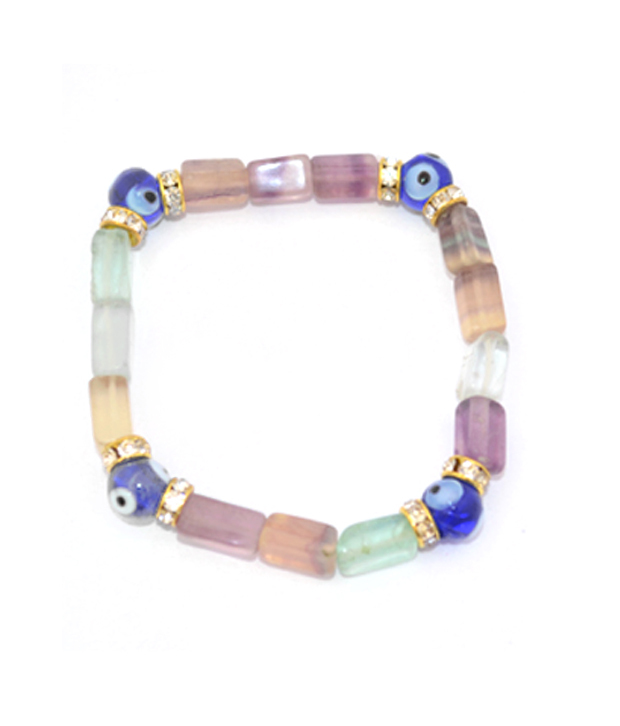 Turkish people believe that it absorbs bad energy coming from evil eyes. Usually, no one leaves Turkey without purchasing a blue and white evil eye charm. No place of business or home is without one they come in many styles, from simple to ornate. Legend had it that it protects you from “bad luck”. “Bad luck” translates into evil or harm wished upon you from another who are jealous of your prosperity happiness & growth. Disclaimer: These Semi Precious stone/Beads are believed to bring about all the good things. We do not guarntee its success and are not responsible for any claims. Any person with a conditions requiring medical attension should consult a qualified practitioner or therapist. Product colour may slightly vary due to photographic lighting sources or your Screen settings.